The Navimag is a large ferry that travels a regular route through the fiords of Patagonia from Puerto Natales to Puerto Montt, and back again. The trip takes four nights and five days, although the first afternoon and night are spent in Puerto Natales Harbour, waiting to set sail in the early hours of Day 2. While it was not the cheapest or quickest mode of transport in Patagonia, for the price we got many amenities, time through some amazing landscapes and food included. Alcohol was also available for purchase at the bar. The Navimag has been a transport for many years, but only in the last decade has been allowed to transport people. The ferry was larger than the ship that took me to Antarctica, but there was about the same number of passengers. Much of the boat consisted of cargo bays, carrying vehicles and other cargo for the local market, including live cattle that could be heard mooing at the most unusual times. Once we were onboard, the cargo bays were of limits to us. The ship contained three levels we passengers were allowed onto during the voyage. 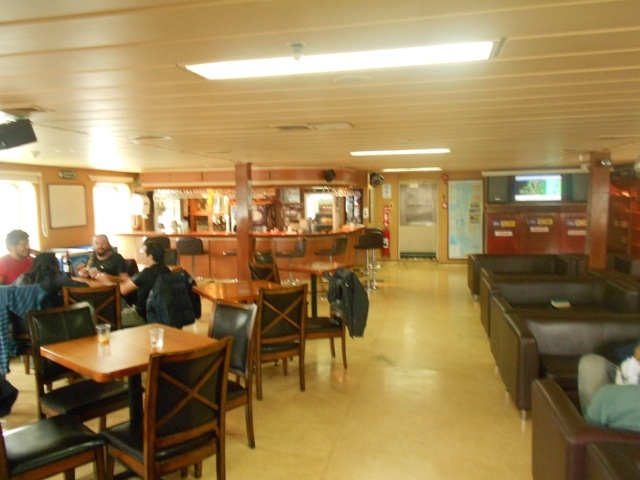 At the top was the bar, a fairly large area where we spent most of their time when not eating, sleeping or doing some of the other activities on board. Level two contained the more expensive cabins and the dining hall. This large room was used for, well, dining, but also for lectures, which they gave twice, once in spanish and once in english. These lectures were about Patagonia, birds, whales, our destination and the like. In the afternoons/evenings they showed movies or documentaries here also. While we were sailing, they showed: The March of the Penguins, Ice Age 4, James Bond – Skyfall, The Vow and several others. Lastly, on the lowest level were the main sleeping quarters. There were several different levels of cabins, from ones with windows and toilets to ones without. 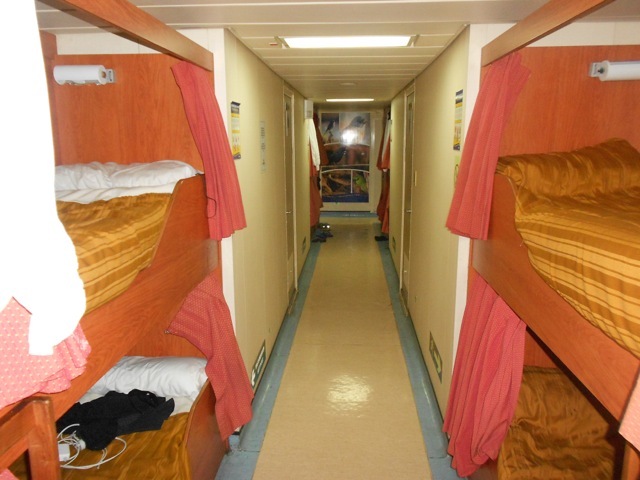 Also in the sleeping quarters was The Dorm, a figure eight corridor with a series of 22 bunks set into the walls. Each bunk had a curtain, a light, a power socket and at the end a locker. There were several bathrooms scattered around the corridor. This lowest level of accommodation was adequate, but the noise of people going past or having conversations kept you awake unless you have a good set of ear plugs. I boarded the ferry on Monday night and hung out in the bar with a friend before heading off to bed. 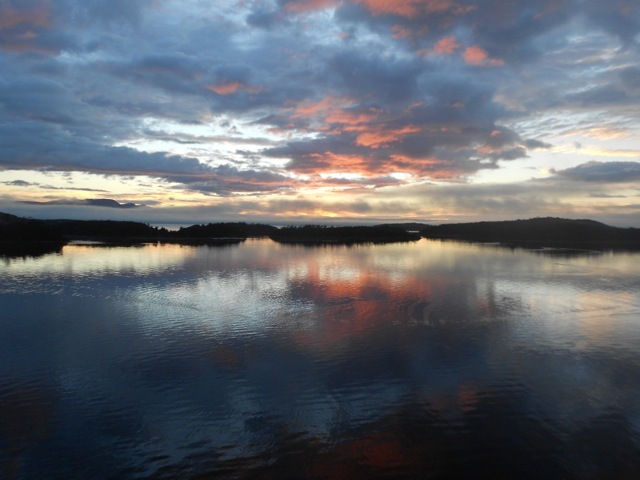 The ferry left port at 8am on Day 2 and meandered its way along the fiords towards the southernmost part of the route, a place called the White Narrows, before it again heading north along a series of channels. The weather grew steadily worse as we went, but we did get a few pictures in the morning. While I was expecting landscapes similar to Antarctica because of our proximity to the South Patagonian Ice Field, the low cloud ensured we saw little of the ice field. The views were mainly of rocky islands with the occasional bird. There were apparent sightings of dolphins and a seal, but not while I was out looking for them. The White Narrow was the only place in the fiords the ship can pass through to head north without heading into the Pacific Ocean and while it was particularly narrow, it wasn’t white. For the rest of the day and night we worked our way through channels with the aim of coming out through the English Narrow into the Golfo de Penas. We were warned that the sea might get a little rough and many of us medicated with seasickness pills just in case. From the gulf we headed out into the Pacific Ocean to round Region Alsen del General Carlos Ibanez del Campo. The rain started before we headed through the English Narrow on Day 3 and continued for most of the rest of the journey. Strong winds hit us in the gulf as did the swell. While my group of companions and I held out fine, that evening the dining room was only half full and many people hovered in their rooms/bunks or threw up in the bathrooms. After my trip to Antarctica, I actually rather enjoyed the roughness of the sea, finding it fun fighting against the listing of the boat to get from one area to the next. 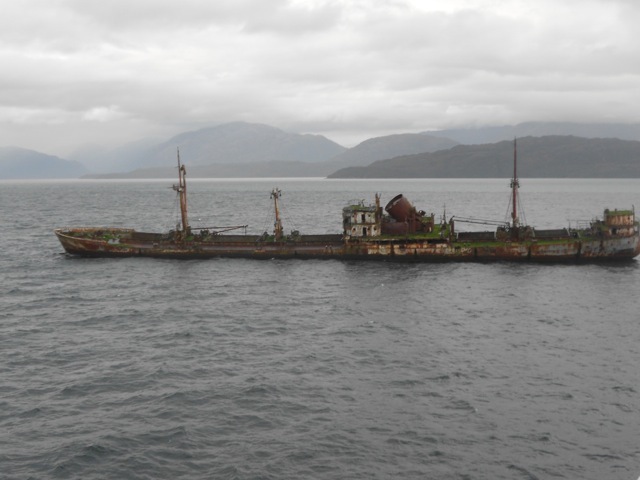 An old shipwreck sitting on a bank. 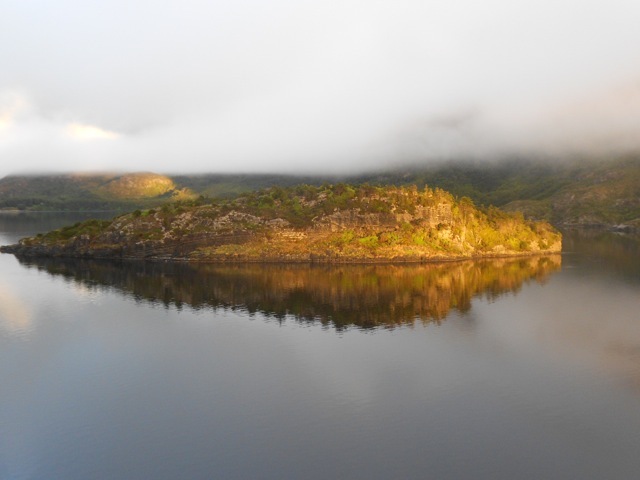 In the afternoon of Day 4, we crossed back into the fiords and reached Canal Moraldes. Overnight we sailed north through Golfo Corcovado, passing Isla del Chiloe before eventually arriving at Puerto Montt in the early afternoon of Friday. We’d been due to arrive earlier that morning, but the winds in the Pacific caused us to run 7 hours late. While cruising slowly into Puerto Montt harbour we were escorted by a Southern Right Whale, a pair of dolphins and a seal. And yes, I saw them this time. While the weather wasn’t the best for the trip and the views weren’t always great, the cruise itself was still most enjoyable. I made friends and hung with them in the bar, playing my board games (Carcasonne and Coloretto). They were very popular as they were different to the standards: the chess, checkers, dominos and the like that was available at the bar. From here, I spent two nights in Puerto Montt planning my trip north and getting supplies ready for hiking in the Lakes Regions, a slightly warmer region of Northern Patagonia.